Welcome to the blog posts of the SAP CX Services Marketing Practice. We are happy to share our experience with you around Marketing Business, Technology and Analytics. Customers who have very specific requirements for Segmentation, Scores or Recommendations in SAP Marketing Cloud sometimes need to create custom views for HANA modelling. In the past this was done via Eclipse (including HANA tools) and you needed time to setup the whole environment, communication to the database and more. Nowadays you can do it purely in a ready to play cloud environment through SAP Cloud Platform. 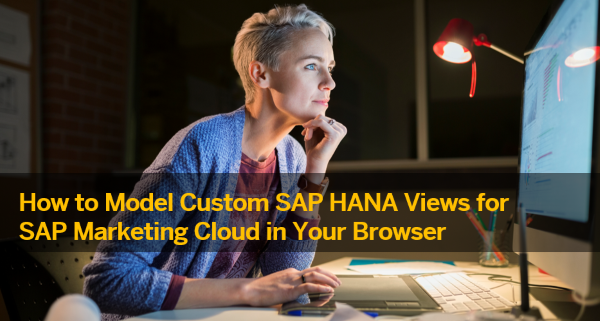 In this blog article I will describe an approach how to do HANA modelling on SAP Cloud Platform and how to add a custom view to SAP Marketing Cloud. This approach will save time, costs and makes collaboration between colleagues easier. Your SAP CX Services Marketing Practice. Hello Maik Offerle : Thanks for the great blog!!. small question: Can you please provide more detailed use cases where custom views are required? a common example is additional logic based on CBOs or field enhancements, e.g. you load activity data from FitBit and want to sum up the total steps with the option to filter by date. The above example would require the usage of a custom hana view. Hi everyone. I used that blog post and helped me very much. Now it’s shorter and doesn’t have all the information. Can you fix that please? You should see this article in the next weeks again on CX Works. Stay tuned for more articles to be published.